We once received an ornate monstrance covered in paint and contact paper. Underneath was gold and silver plating that had darkened with age. We carefully restored the piece and the congregation members were moved to tears when they saw the monstrance with its brilliant glory renewed. Most of the church's members had never seen the piece as it was meant to be as the staff had covered it up long ago, unsure of how to fix the worn, tarnished appearance. A piece like that was very special to that congregation. The value of the sentimental aspect of altar ware which is commemorative, historical and holding deep personal meaning to the church or the individual pastor becomes priceless and simply replacing it with a new item is just not an option. 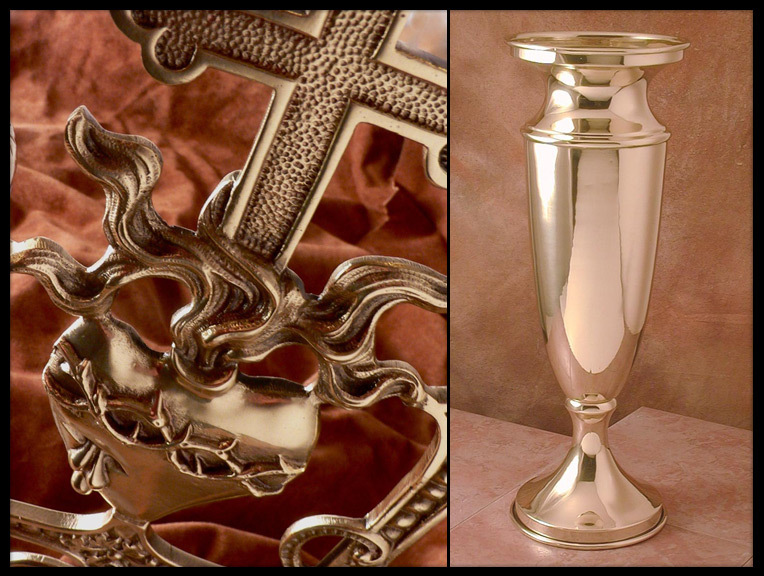 Beyond the sentimental aspect, although there is no shortage of companies offering a wide range of new altar ware, it can be difficult to find pieces that match your church's existing inventory and there is always the question of cost vs value. A new vessel may be made of thinner, less durable metal than older vessels and, when plated, the thickness of the plating itself is often less than what the older pieces had. That translates to reduced service life and a vessel that is of lesser quality than the older one it is replacing. Still the cost of new items can be surprisingly high when compared to the option of restoring an older item. A new gold plated chalice of any quality can cost upwards of a thousand dollars or more, while your original vessel can typically be restored with new plating for about half that. A solid brass candelabra costing some $1600 new can be carefully restored to like-new beauty for less than $400. In general, the heavy plating we apply will last much longer than the thinner plating on new production pieces, which gives you greater value for every dollar you spend. We have seen and restored many altar pieces that are so old and so elaborate that replacement is nearly impossible at any price. Dents, dings and breaks can also be repaired and the piece returned to service. Beyond the altar, the same type of restoration is available for your church building's architectural hardware... hinges, door handles, even lighting fixtures. We showcase photo galleries on our website of the restoration of these treasured pieces, and may surprise you as to the extent of the work required. We invite you to take a look when you can!